The French really wanted to attack England directly, but they knew that the English were preparing for this possibility. The relative weakness of the French army coupled with the knowledge that the English were putting barricades up in the streets to prepare for this invasion made them change their minds. Napoleon chose to attack Egypt instead, in large part because he was really interested in the history of Alexander the Great, and this would allow him to walk in the footsteps of Alexander. This seemed like a good place to attack because of its position as a ignored portion of the Ottoman Empire (had been a part since 1517). There were many problems with attacking Egypt, not the least of which was trying to get past the British Navy power to get there. Once they landed in Egypt they would be forced to fight the Egyptians and Turks, led by the Mameluke warriors in Egypt. Mamelukes had been trained since birth for military and were world renowned for being the military that had officially stopped the Mongol invasion centuries before. They were not worried about invasion at all, seeing the French as Godless heathens and poor soldiers in comparison. make the Egyptians allies with him against his European enemies. He would stop on the way at the island of Malta, which was run by a group of Christian Knights, with the official goal of gathering supplies for his invasion. His real goal was to conquer the island city and release the Ottoman slaves in a propaganda effort to make the Egyptian people believe he was on their side. He would also outlaw pillaging against Muslims so that it didn’t unite the Muslims against them in this fight. The French were able to sail to Egypt without harassment from the British because they believed the French were invading England not Egypt. This secret was kept from absolutely everyone except for the highest generals in France. He would call for thousands of soldiers to be massed at Toulon, but no one had any real idea where they were headed. They simply knew that they were planning a large attack somewhere. Napoleon would choose to attack during the summer, which was seen as completely insane due to the heat, but allowed them to surprise the Egyptians completely. They landed just outside the city of Alexandria in a city called Rosetta and prepared his military for the upcoming attack. The Egyptians had a hard time believing that the military was led by Napoleon, thinking he was too short and skinny to be the leader. That was partially due to the fact that the Egyptians usually placed their best fighter in a leadership position instead of their smartest tactician. For this reason, the Egyptians would assume that General Dumas was the French leader, since he was 6’1” and was well-built. While Napoleon is usually seen as an amazing planner, this invasion had a number of major problems that they would run into immediately after landing. The French didn’t bring any food and tents for their military, assuming the people would help them, so the men quickly ended up homeless and was scraping for food wherever they could find it. When the French started to move they would march into Egypt with 40 lbs. backpacks and dark clothes (in high heat). Some of the soldiers were kidnapped during this march in the hopes of ransoming them back to the French at a later date. The first and most famous battle of the Egyptian Expedition would happen at the end of this march. The French were outnumbered at least 2-1 in the Battle Of The Pyramids (1798), but did have a technological advantage in comparison with the Egyptians. They would be forced to fight the Mamelukes, the Janissaries, and the Bedouins in a single army as well as the famed Mameluke cavalry. Napoleon would create his first (and only) new tactic during this time, creating artillery squares to defend themselves against the cavalry. These squares were made up of lines of troops that were 6 deep with artillery on each corner, in an attempt to protect his artillery in battle. The Mamelukes charged in completely uncoordinated attacks during this battle and were never able to inflict serious damage against the French. The Mamelukes could have won had they coordinated attacks better, but they were overly confident since they had never see an attack fail. The French would kill between 2-6,000 Egyptians/Mamelukes and only lose 29 of their own troops, ending 700 years of Mameluke rule in Egypt. This battle would be named the Battle Of The Pyramids by Napoleon even though the pyramid was between 9-15 miles from the actual battlefield. He decided it would be more interesting if the pyramids were thought of as closer, giving it better propaganda value for the French. Another lie would develop over time that Napoleon shot the nose off the sphinx during or immediately after the battle. While this is a common myth, the truth is that the sphinx had lost its nose at the hands of a Muslim fanatic (1378) who vandalized the statue because he thought it was an idol, which is wrong in Muslim belief. 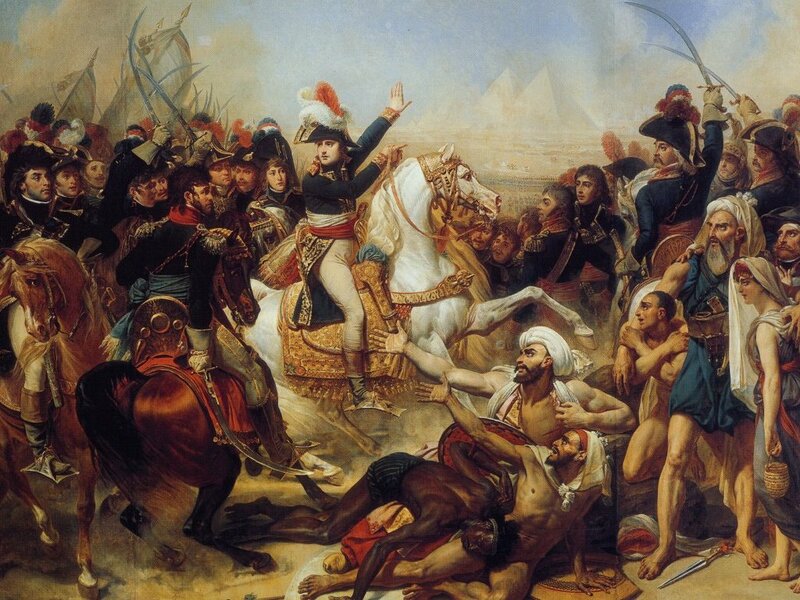 Napoleon did have a seriously difficult time while he was in Egypt for other reasons than the military issues they dealt with. His wife would actually cheat on him while he was in Egypt. A letter in reference to this infidelity would be captured by the British and then printed in their newspapers for the world to see. Not only would Napoleon be told of the infidelity of his wife, but it would be done in the process of telling the entire world about the failure of his marriage. He would take a number of lovers while he was in Egypt because of this, one that he ironically nicknamed Cleopatra.